TheBook from Augen might not be perfect but it’s not that bad either, especially for costing under $100 and for everything else it can do for that price. The 150 books included are a fairly decent selection that I think most people will find enjoyable. It does have its little quirks that you’ll have to deal with, but for an inexpensive ebook reader I don’t think it’s too bad. You can use the SD card slot to expand the 2gig of onboard memory and you can use wi-fi to browse the web. The ability to play videos and music is a nice bonus, it does both fairly well. All in all I like it, sure it isn’t the best option out there, but for a beginner ebook reader it does the job I think. Depending on your ultimate goal of owning an Android tablet, you can decide if this tablet is right for you. The ideal user for this tablet would be someone who is patient, likes the basics while appreciative of the basic Android user interface. We have said before and we’ll say it again, the Augen GenTouch 78 is priced at $179.99 and is available at Kmart and as many of you already know, when it comes to mobile technology, you get what you pay for. With the attention this device received when it first hit the shelves, we’re curious to compare this tablet to the six rumored tablets that Augen has in store for us next year. We rated this device overall 2 out of 5 given what this tablet could be for the price at which it is currently being offered. 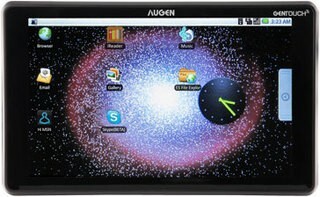 The Augen Gentouch78 is by no stretch of the imagination a powerful device but it is what it is. It’s an inexpensive Android based tablet that’s fun to use and enjoy, it won’t replace an iPad or something like the Galaxy Tab, but it only costs a fraction of either one. Taking into account the price and overall performance I’d say it’s not a bad little tablet really. The Gentouch78, as is, would make a great portable media player, comic book reader or e-book reader, just don’t expect to do any major computing on it and you won’t be disappointed. Yes it does have a resistive touchscreen and there’s a lack of Google apps, but I quickly became accustomed to the screen with no issues and it worked fine for me. Google apps, well I do miss those, they need to come back and I’m sure there’s a way to do it from what I’ve been reading. The Gentouch78 though does seem to have quite a few people interested in it over at XDA and there’s even a site dedicated to it. You can root it, flash other roms and do many other things just like you can with your Android phone. I found that it works fine with the Droid Explorer program and with Google SDK tools as well. This tablet might not be the flashiest or fastest out there but it has potential to be a lot more than it is at stock with a few tweaks or hacks done to it. I fully plan to explore all of my options for those things now that I’ve completed the review, and maybe I’ll do a follow up to this. Don’t get me wrong here, there’s plenty wrong with this tablet, it’s not something for someone who wants to jump right in and expect it to work perfectly. I like to play with my gadgets, I’ve frequented XDA for many years, unlocking, rooting, flashing roms and most everything else that can be done with a phone. The average consumer though isn’t going to want to do things like this, let alone even have a clue how to do them. If you’re into Android and like tinkering with things then yes get this tablet, it has a lot of untapped potential. The GenTouch78 was never going to be a powerhouse or the most desirable tablet this side of the iPad, but even at $149 it's a waste of money. The Archos 7 Home Tablet, which was no prize in itself, is a better choice, as the company at least includes media codecs. Yes, having the Android Market (assuming Augen can get it working) and core apps on a tablet is a treat, but they don't make up for this slate's awful resistive screen, awkward button placement, and other deficiencies. We can see hackers and tinkerers potentially gravitating toward the GenTouch78 as a cheap Android testbed, but for general consumers, it's not worth the investment. We’ll be spending a bit more time with the Gentouch 78 to make a final call on its functionality, but it’s crystal clear that this isn’t a high-end device. If you were hoping to find a beautiful iPad substitute for a fraction of the cost, keep on looking. However, considering most Kmart’s have been selling out of these within hours of receiving new inventory, this just may be the answer all you cheap tablet seekers have been looking for — just be prepared to put up with more than a few annoyances along the way. Visit the Augen Q&A Forum to get answers, ask a question or help others.